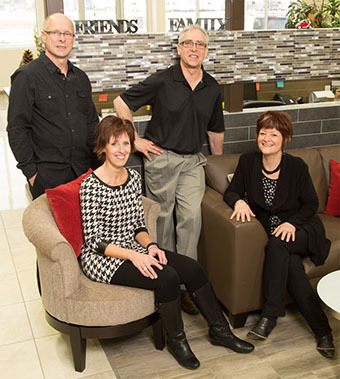 Family means everything to us, and by family we mean everyone who works and shops at Wagner's Flooring. It's the way we were taught to do business: to be fair, to always be honest, and to take good care of people. Today, in our second generation and after forty years, we still continue the Wagner tradition of providing excellent service to our customers and a great place to work for our staff. Wagner's Flooring Canada is more than just a flooring specialty store. We are experts trained in flooring sales and design and will help you find the perfect floor for the way you live. Let us help you create the find the floors of your dreams. As part of Canada's leading flooring retail group, our 500-store nationwide buying power guarantees you low prices on thousands of carpet types and other flooring options backed by the most solid warranties in the floor covering industry. Wagner's Flooring Canada offers a huge selection of floor coverings including carpet, hardwood, vinyl, tile, laminate and area rugs. We also offer custom blinds, Beam central vacuums, and cleaning products. Our commitment to our customers and neighbors is unparalleled. We take pride in being the best at what we do and are dedicated to your complete satisfaction. Contact Wagner's Flooring Canada today for your professional free measure or an in store consultation at our Yorkton location. Find directions to the right of this page.